In this entry, we compare Turkey’s post-2005 performance in current account balance with three other comparable developing or “emerging” economies: Mexico, Indonesia, and Nigeria. Together these countries are referred to as MINTs. While these countries have significant differences among themselves, they are all middle income countries with similar demographic characteristics. According to a BBC news analysis, “they are all going to see a rise in the number of people eligible to work relative to those not working”. 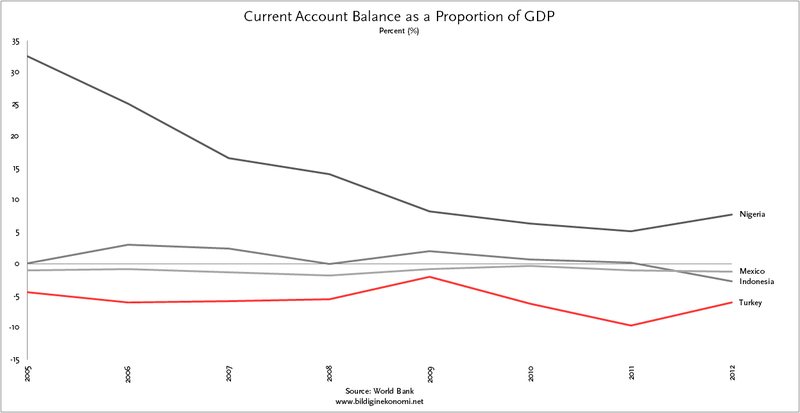 The trends of current account balance as a proportion of GDP in Table 1 indicate that Turkey differs from the other three MINT countries. Nigeria, as an oil exporting country, has a significant current account surplus. One possible explanation in the declining current account surplus of Nigeria may be the global economic slowdown that kicked in after the 2008 crisis. On the other hand, Mexico and Indonesia has a proportion that hovers around zero percent—while Indonesia experienced a marginal surplus through the period, Mexico never did so. Turkey has a much more accentuated and sustained proportion of deficit with an average of 5.7% for the entire period. It should be noted that this average is in part lowered by the 2% current account deficit in 2009, a result of reduced economic activity due to global economic crisis. When we look at the post-crisis period average from 2010 to 2013, the proportion of the current account deficit to GDP reaches 7.3%. Please see Balance of Current Account entry for more detailed discussion. Dataset is downloaded from the World Bank website, “World Development Indicators” link.